How would your blogging game change if you had in-depth trainings, focused monthly implementation challenges, a positive support community, and an engaged blogging mentor? It's time to find out! Join my online blog school and community! Blogging can be lonely while at the same time extremely overwhelming. You can be in dozens of Facebook groups and communities but never really feel supported. You can take courses but regularly find gaps in your blogging education. Typically the gaps in your blogging education cause two things. 2) Make you want to give up. I don't want to see that happen to you! I know it can be prevented! 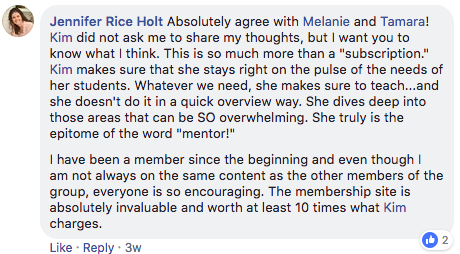 That's why I decided to create a special ongoing learning environment geared toward bloggers who need a supportive "no dumb questions" community with the resource they need to Just Keep Blogging. 1) A full library of videos, audio learning, lessons, and printables to help fill in the gaps of your blogging education. 2) Fresh topic-specific how-to videos, audio learning lessons (so you can learn while on the go) that range from beginner to advanced tactics released each month. 3) A live, interactive coaching Q & A sessions for beginner level bloggers. 4) A Live, interactive coaching Q & A sessions for intermediate to more advanced bloggers. 5) Exclusive monthly implementation contest challenges with one on one coaching prizes. 6) Exclusive Just Keep Blogging Podcast Episodes not released to the public! 7) Exclusive member-only discounts and early access to Kim Anderson Consulting Products. 8) FREE BONUS -- Closed Members Only Facebook Community Approval = More engagement, more Live streams and more encouragement! *Lifetime price applies as long as you maintain your membership without interruption. If you cancel your membership and come back at a later time, you will pay whatever the price is at the time of registration.